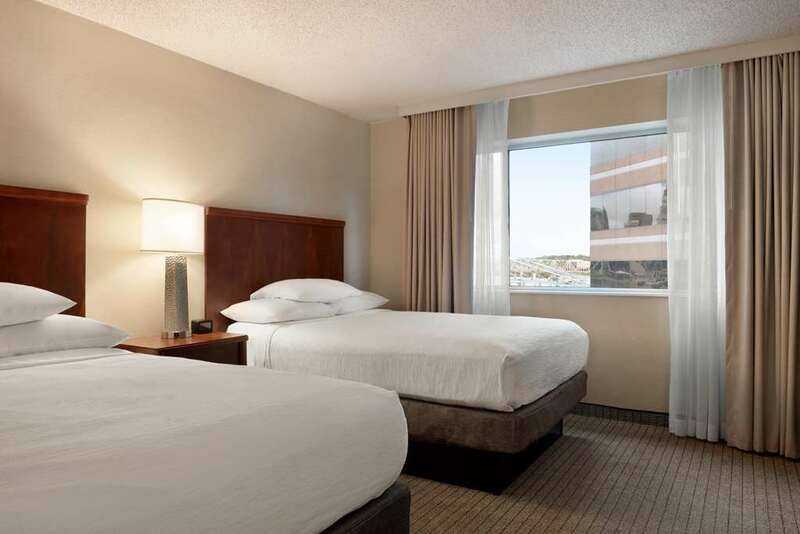 THIS HOTEL IS 100PCT NON SMOKING Embassy Suites Cincinnati Rivercenter located in revitalized Covington KY offers an unrivaled location for your Ohio or Kentucky vacation or business trip. This greater Cincinnati hotel is situated on the Southbank of the Ohio River offering magnificent views of the downtown Cincinnati skyline. We*re excited to announce the completion of recent renovations and welcome guests to enjoy our beautiful new atrium. A top choice for hotels in the downtown Cincinnati area our all-suite hotel is positioned near numerous businesses corporations and attractions including The Aronoff Center -1.5 miles BB Riverboats -1.5 miles Cincinnati Museum Center/Omnimax at Union Terminal-3 miles Cincinnati Zoo - Botanical Gardens-5.6 miles Great American Ballpark home of the Cincinnati Reds-.5 miles Mainstrasse Village-.8 miles Music Hall-2 miles National Underground Railroad Freedom Center-.5 miles Newport Aquarium-1.3 miles Newport on the Levee Entertainment Complex- 1.3 miles Northern Kentucky Convention Center-Across the street Paul Brown Stadium Home of the Cincinnati Bengals-.5 miles Taft Theater-1.3 miles US Bank Arena-1.3 miles River Bend Music Center-9.9 miles Greater Cincinnati/Northern Kentucky International Airport-12 miles After a busy day of meetings or exploring the area retreat to the comfort of our Covington Kentucky hotel featuring breathtaking skyline and Ohio river views and extensive amenities and services at your fingertips. Enjoy one of over 200 bourbons in our new Bourbon Bar and Restaurant NEAT featuring local craft beers and a Southern inspired menu. Pick up 24-hour grab and go snacks and sundries from Eterie Market settle into one of our newly renovated rooms featuring all new suite furnishings and two 49-inch HDTVS or enjoy our full restaurant menu through In Room Dining. This hotel is 100 non-smoking. NEAT Restaurant - Bourbon Bar: Our brand new bourbon bar and restaurant NEAT features over 150 bourbons local craft beers and a southern style menu featuring southern classics like shrimp and grits chicken and waffles and fried green tomatoes. Our grab and go food and drinks are a great option for dine-in or carry out.